A home energy audit can help homeowners identify problem areas and take steps to improve efficiency and reduce their environmental impact, such as installing a heat pump or more efficient appliances. A home energy audit is a comprehensive process that involves checking for window and door drafts, inspecting HVAC systems, evaluating appliances, examining insulation, checking ductwork, and more. Qualified technicians will use infrared cameras and other tools to carefully examine your home for potential energy waste. When they’re done, technicians will provide homeowners with a report and suggestions concerning how to improve energy efficiency. Your energy bills are higher than your neighbors’ bills – Talk to neighbors about their monthly electric bills. If their homes are about the same size as yours and have the same number of occupants, their electric bills shouldn’t be too different from yours. If their bills are significantly lower, it could be a sign that your home has some efficiency issues. Inconsistent room temperatures – If you need to wear a parka in your living room but your bedroom is sweltering, it’s a good sign that there are some issues with your HVAC system or that leaks are present in your windows and doors. A home energy audit can isolate the problem. You have older appliances – There are many perfectly good older appliances that have decent energy efficiency ratings. That said, appliances manufactured 10 years ago are nowhere near efficient as modern appliances. Older appliances may have their efficiency even further diminished by age and wear and tear. Strange smells in the house – If there’s a rotten egg smell in your home, this can indicate a gas leak. If your home smells like the fireplace or garage, this could indicate substantial air leakage. 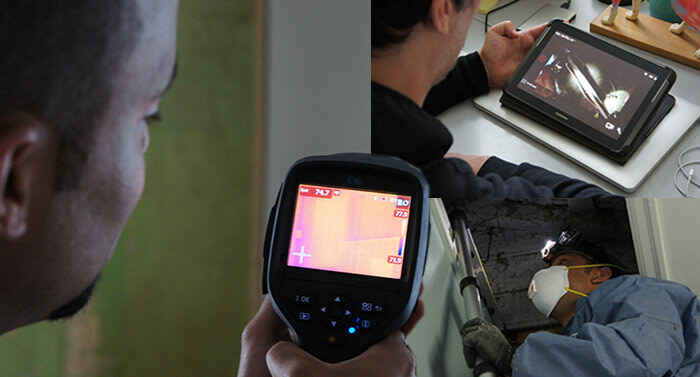 An energy audit can determine the cause of the problem. Condensation on your walls or windows – This can indicate a water leak or ventilation problem, both issues that can impact the energy efficiency of your home. By scheduling an audit and following the recommendations the audit will provide, you can greatly increase the efficiency of your home and head off potential problems from mold, moisture damage, or other home repair issues. When hiring a contractor to provide a home energy audit, it’s important to find a company with significant experience in providing home energy audits. These audits require special tools and training, so a professional firm with a track record of success is the ideal choice. Washington Energy Services is a family-owned business providing home energy efficiency solutions to Seattle area clients. Founded in 1957, Washington Energy Services has generations of experience in providing heating and cooling and other energy-related services, including sales, installation, and service. A member of the Puget Sound Energy Contractor Alliance Network, Washington Energy Services has an excellent local business reputation. Whoa! My utility bills are too high! Posted On: November 26th, 2013 Filed Under: Heating, Cooling No Comments on Whoa! My utility bills are too high! Switch from electric heat to natural gas if available on your street. There are great utility rebates from PSE, plus your ongoing heating cost will be about 25% lower. Switch from baseboard heating to ductless or air source heat pump, to lower heating costs by up to 50% and get air conditioning as a bonus. Prices are coming down on ductless systems and there are excellent utility rebates up to $1500. Add a programmable thermostat to lower the heat while you are not home. These used to be difficult to figure out but technology has improved, making it easy to lower heating costs by about 10%. Maybe it’s not your heating system but an increase in cold air leaking into your house. Besides caulking windows and weather stripping doors, professionally air sealing and insulating your home can reduce drafts, and allow you to utilize less heating to achieve the same level of comfort. And there’s always that one you don’t want to imagine… but it happens. Is your neighbor plugging something into an outlet on the exterior of your house? How healthy is your gas furnace? A furnace that is older and/or not maintained is using extra natural gas to keep up with your demand for warmth. Gas furnaces lose energy efficiency as they age and parts wear. The less efficiently it operates, the harder it works to keep a constant temp for you. The same goes for natural gas water heaters. If your heating system is more than 15 years old, your 90% efficient appliance might only be 80% at best. Check for leaky ducts. A significant portion of your heat can be wasted by escaping through leaky ducts. Combine that with some plumbing or electrical penetrations that are not sealed in the attic, and your heat can just be pouring out of the house. This is something that most homeowners are not able to ascertain on their own. A certified Home Energy Auditor will use specialized equipment to measure the heat loss, air leaking and air flow of the home and show you how areas of concern. Has the insulation lost its fluff? The EnergyStar folks at the US Department of Energy start their discussion of energy saving with insulation for a reason – it’s really the number one way to make a significant difference in the amount of heating you will need for your home. Right now there are great rebate incentives to add insulation and it can benefit homeowners with reduced heating and cooling costs. Check your heat pump settings. If you have an air source heat pump attached to your gas furnace but still see your furnace turning on more than expected or using more gas than expected, you may have the heat pump set to switch over to backup heat at too high of a temperature. Heat pumps can get below 40% without having to switch over. Consult a professional heating contractor if you have a question about this. Change your air filter (furnace filter) as scheduled. Clogged filters make your equipment work harder. Check for a gas leak. A large leak would be something you can smell and you should call your utility immediately. Small leaks can happen in and around older gas appliances and in an open space like a basement or garage you might never smell them. This is also something that a home energy audit would test for. If you have a propane heater or oil heat, you are in a different category of bills altogether. These fuels are up to four times the cost of gas or electric heat pump heating. Even if you want to keep your propane or oil fueled heating system, the same options are available to you to lower your bills. Just follow the items we have outlined under the Gas bill section, and you can see lower energy costs too. We’ve heard it all, and we’ve helped customers with all of these situations, bringing their energy costs down and increasing home comfort. For your free estimate or for a service appointment contact Washington Energy at 800-398-4663 or click to send your request via email.